Formerly larger private bedrooms of the magnificent palace, Royal Deluxe Guestrooms are adorned with decorative accents that highlight the carefully-preserved layout. Comprised of two singles or a double bed, these spacious guestrooms are perched above the central courtyard lending panoramic views of the Lalgarh Estate. Royal Deluxe Guestrooms are separated by an inter-connecting hallway, creating accommodations ideal for groups of friends or families. 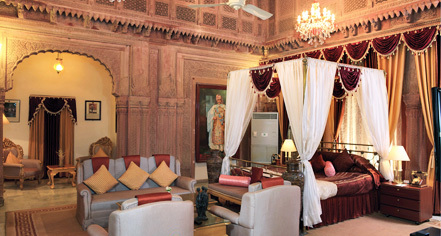 Originally the lavish apartments for members of the Bikaner's royal family, the resplendent Palace Guestrooms afford comfortable ornate 18th century rococo furniture, and elaborate antique accents, including four-poster brass beds, escritoires, Old World dressing tables, porthole-shaped shaving mirrors, and glorious sunken bathtubs. Looking out to the verdant lawns, these stately accommodations are equipped with modern luxuries, boasting a decadence truly fit for royal guests of the past and present. For over a century, since its use as the bed chamber of a prince, the historic grand marble-walled Karni Vilas has remained relatively unchanged since its conversion into a hotel suite. Rich in Utsa art embossed in brilliant blues and golds, the Historic Suite boasts a teak ceiling with inlaid gold-covered carvings that complement the thoughtfully-appointed frieze. Painted in indigo, amphora motifs and scenes depicting shikar, a form of hunting regarded as a regal sport, are displayed throughout the vertical panels of the suite walls. Thoroughly preserving its historic charm, the suite bedroom leads to a spacious dressing room and a large antique double bath. Beaming from the Burma teak ceiling, garnished with a detailed carved grid washed in a vibrant blue, twin images of the Sun God, Surya, command over the luminous suite once occupied by the honorable Maharajah Sir Ganga Singh. 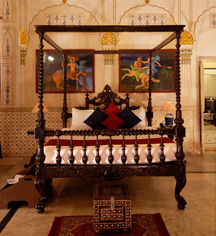 Complementing the vibrant ceiling, rendering an authentic royal experience, the original elaborate furnishings used by the Maharajah remain, including the brass canopied four-poster bed, stately escritoire, coat rack, gramophone, and the heirloom jhoola, an indoor swing, still displaying its original silk upholstery. Sumptuously-appointed with a separate dressing room and a generous bath layout, the Presidential Suite affords decorative accents that have been carefully preserved from the palace's intial build in 1904. Lending the whimsical ambiance of its original glory, the suite is furnished with an media armoire, writing desk, canopied four-poster bed, card and dining table, and sofas with ottomans and pouffes. With a brilliant metal door-fastener fashioned in the shape of interlocked fists and a pair of bronze horses standing guard, the splendor of the Presidential Suite is unassailable, boasting a truly intimate haven. Boasting unparalleled views of the Lalgarh Palace complex from two covered marble terraces, the intimate bridal private suite is situated on the second floor of the palace, offering the ultimate romantic escape. Featuring bolstered seating in charming alcoves, Usta glasswork and marble, treasured furniture, and a spacious bath, the suite and its surrounding area is sectioned off for bridal parties, affording a semi-detached enclosure, remote from the bustle of the ground floor. Laxmi Niwas Palace, a charter member of Historic Hotels Worldwide since 2013, dates back to 1904.